These framed cork boards, sometimes spelled "corkboards" are ideal to display information in break rooms, cafeterias, or other business environments. Each notice board, or framed tan bulletin board, found here allows you to keep your customers, staff, or students up-to-date with new posts. 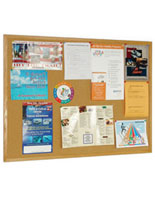 An open face board, such as these discount framed cork boards, allow users to easily add, remove, and change messages or posts. A framed bulletin board includes not only includes a natural tan cork surface but also a strong frame, made from either oak or aluminum. Either design provides a lightweight tool for sharing important information within a community. The economy cork boards come with various choices of frames that fit your every need. The bulletin boards with frames also make your organizations and businesses look professional. The framed cork boards can be used not only in professional environments but also in academic settings like schools and colleges. Aluminum frame cork boards have high quality construction that is built to last long in professional environments, from offices to entryways. The wooden framed cork boards are equally useful in offices, but are also widely used in homes as memo boards and home decorations. Where can you use these wholesale framed cork boards? Tan bulletin boards like these are often used in school classrooms, colleges, and other education institutions. Each discount cork board is ideal for businesses and offices where there is a need to display information to employees. These framed cork boards are great for delivering messages in hallways, libraries, and other public areas. Traditional pin boards are very economical in price, so they can also be used for residential purposes to keep things in order. Bulk framed cork boards, such as oak or aluminum frame bulletin boards, are optimal for any indoor setting. The open face design comes with various choices of materials and finishes, so customers can order they style that's right for them! The natural tan framework and neutral cork surface allow them to blend in with any décor. 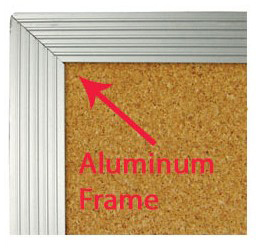 Aluminum frame bulletin boards are strong and built to last long. Satin aluminum frame cork boards are great for both professional and home use. The plastic cover on the corners can protect people from being hurt by sharp cornors. These framed corkboards also feature a lightweight design, allowing them to be wall-mounted with alleviate. In addition to oak-framed bulletin boards, we also sell cork boards with an aluminum framework as well. What features do these open face cork boards have? These plain cork boards are covered by high quality aluminum frames. Each affordable cork board makes it easy to add, remove, and change information. Natual wooden frame boards are great decoration for your office and home. Stongly built cork boards are reusable and built to last long. Presentation boards, corkboards are a great addition to your office, classroom or conference room. These thumbtack cork boards have a classic look yet the natural self-healing cork encased by an oak, aluminum or graphite frame catches attention. Discount cork boards are the preferred communication center for schools, universities, fabrication floors, and more because they're so cheap and easy to use. Supermarkets or convenience stores always place their specials and sale merchandise on an announcement panel. Tack a bright colored graphic to advertise an event or display some photographs to promote a trip. Either way, these cork boards have thousands of uses! Thumbtack boards are found in locker rooms to show rosters, tryout schedules, and upcoming games. Add one of these affordable cork boards to your location to post sign-in sheets or advertise local services. Our cork board collection includes three types of frames: classic oak, trendy aluminum or the upscale graphite. Cork board is an indispensable posting systems. They are an economical & efficient way to organize your information. Displays2go message board line goes beyond classic look. We offer dry erase, enclosed bulletin corkboards, enclosed fabric & many more. In addition, Displays2go also offer outdoor panels and letterboards. Displays2go message panels inventory includes hundred of models! All our products are made out of the highest quality and are sure to last! Retailers, teachers, managers get your best corkboards here from Displays2go today. We are proud to have one of the grandest inventories in the country, therefore most of our products will ship same day if ordered by 3PM EST unless otherwise noted. Since 1974, Displays2go specializes in producing & distributing quality display products. As one of the USA's leading pos display manufacturers, we sell over 7000 products at extremely affordable prices. We even offer price breaks for higher quantity orders. Buy online or give us a call at 1-800-572-2194 M-F 8:00am to 5:30pm EST.